Takashima Castle (高島城) was built in 1590 by Hineno Takayoshi, one of Toyotomi Hideyoshi's Samurai. The castle was called "the Floating Castle of Lake Suwa" because it appeared as if it rose out of the water. There is reconstructed Tenshu-kaku and moat, walls and gates are exits. 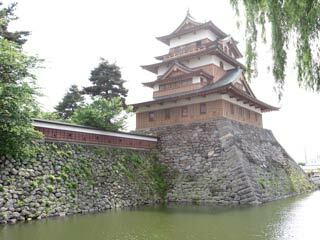 It is shozen as one of three major castles of lake in Japan. Admission for Tenshu: 300 yen for adult, 150 for kids. The construction of this castle was begun in 1592 and finished in 1598. It was called "the Floating Castle of Lake Suwa." At that time, the water of lake reached as far as the castle side, and the moat of the castle was drawn from the lake directly. Suwa Yorimizu replaced Hineno Takayoshi in 1601 ad for 10 generation, 270 years, his descendants governed the Suwa area. The last Suwa clan ruler was Suwa Tadaaya who was removed from office with the abolition of the clan government system and the establishment of prefectures in Japan. The castle was torn down and the site was opned to the public in 1876 as Takashima park. Almost 100 years laer in 1970, Takashima castle was reconstructed with financial contributions donated by residents of Suwa who felt nostalgia for the city's old landmark.